A store owner is using a different kind of greeter to welcome people at the door. She has dressed up her dog in jeans and a t-shirt to attract and welcome passerbyers. 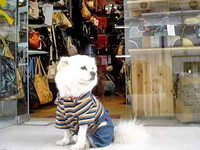 When a customer enters, he smiles and barks, and when a customer is leaving, he will bow to express his gratitude. Hope the dog gets a really good store discount for doing this. This entry was posted on Thursday, May 3rd, 2007 at 3:53 am	and is filed under Dogs, National Dog, Cat & Pet Info, News for Cats, Dogs & Owners, Entertainment About Pets. You can follow any responses to this entry through the RSS 2.0 feed. Both comments and pings are currently closed.